Shirts With Random Triangles: Alabama DL Jarran Reed arrested on DUI charges. Another Alabama player has landed himself in hot water with the law. 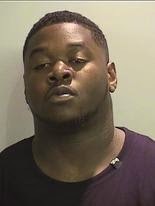 Defensive lineman Jarran Reed, a junior JUCO transfer, was arrested in Tuscaloosa, Al. on charges of driving under the influence. According to the Tuscaloosa Police Department, a police officer observed Reed as his Dodge Charger allegedly collided with another vehicle while attempting to back out of a parking space. "On 7/13/14 at approximately 1:50 am a Tuscaloosa Police Officer observed a 2001 White Dodge Charger backing out of a parking space at the same time as another vehicle. The two vehicles collided and the white Dodge Charger drove off towards the exit of the parking lot. The Officer went over and instructed the driver to stop the vehicle. The officer made contact with the driver of the vehicle and immediately smelled the odor of alcohol coming from inside the vehicle. A Standardized Field Sobriety Test was given to the suspect. At the end of the test the officer found probable cause to arrest the driver for driving under the influence. The driver was transported to the Tuscaloosa County Jail pending a $1,000.00 Bond and a hold for sobriety. The drivers Blood Alcohol Content was 0.13% (legal limit is 0.08%)." Reed was charged with driving under the influence. The arrest comes eight days after another Alabama football team member, running back Kenyan Drake, was arrested on charges of obstruction of "governmental operations. Reed transferred to Alabama earlier this year from East Mississippi Community College. Reed has a bright future ahead of himself. He needs to get his head on straight and learn from this mistake.